In addition to life and property damage, a magnitude 9 earthquake could disrupt vital services and utilites throughout the area. The immediate disruption in Portland from a subduction zone earthquake may be small compared to the longer term effects on infrastructure (pdf). Some utilities may be unavailable for days, weeks, or months. Utilities such electricity, water, sewage, oil and natural gas travel across the Columbia River and North Portland Harbor to provide services to Hayden Island. Pipelines running through Hayden Island include a major water main, a natural gas feed line, and communications trunk lines carried on the I-5 crossing of North Portland Harbor. In addition, trunk communication lines are located on the southbound I-5 crossing of the Columbia River, and underwater power cable and telephone lines are located under the bed of North Portland Harbor, immediately west of the I-5 bridges. A major telephone trunk line is located under the bed of the Columbia River approximately 500 feet east of the existing I-5 bridges. I-5 bridges, highways, and railroad lines may not be passable. Some estimate 56 bridges along highway 101 will collapse. In 2009, ODOT released the Seismic Vulnerability of Oregon State Highway Bridges. The study, using an earthquake scenario of M 7.0 in the Portland metro area, estimated there would be five complete collapses, 48 structures with extensive damage and 41 structures with moderate damage. A study assessing the vulnerability of the I-5 Columbia River Bridge recommended a seismic retrofit. The Port’s four marine terminals lie in close proximity to major rail and highway connections. 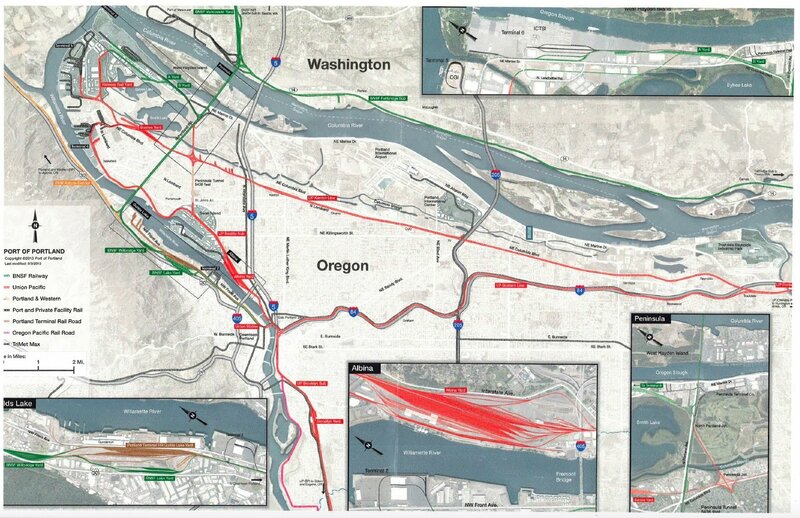 Rail routes near Hayden Island are highlighted in red (for Union Pacific) and green (for Burlington Northern). An earthquake could create slides, blocking tracks or derail cars, potentially a serious issue when so much oil is now being moved by train. The Oregon Fire Marshall recommends that in the event of a large oil train incident/spill, downwind evacuation should be at least 1,000 feet and if the car is involved in a fire, evacuation for 0.5-mile in all directions is recommended. The Columbia is 2,400 ft wide near the I-5 bridge. Evacuation might include some of Hayden Island with a strong southern wind. The ENS (Emergency Notification System) is a sign, posted at or near a crossing, that lists a telephone number along with a US DOT number. The ENS is used to notify the railroad of an emergency or warning device malfunction. A train’s CONSIST is a document in the locomotive showing the number of loaded or empty cars, weight in tons, and length in feet of a specific train. A locomotive consist shows the identifying number and location of each locomotive within that consist for a specific train. The top five hazardous materials are ammonia anhydrous, chlorine, sulfuric acid, sulfur dioxide, and nitric acid. Here’s an inventory of airport facilities around Hillsboro and PDX by the Port of Portland. Airports in the region include Scappose, Hillsboro, McMinnville, Troutdale, and Aurora. All of the electric utilities in the Western Grid are electrically tied together during normal system conditions and operate at a synchronized frequency of 60 Hz. Colstrip has a combined peak output of 2 Gigawatts, making it the second-largest coal-fired generating facility west of the Mississippi River. The plant’s power output travels about 250 miles west, to Townsend, Mont., over two 500-kilovolt transmission lines the companies collectively own. From there, Colstrip power moves across the Bonneville Power Administration’s transmission system before reaching the utilities’ individual transmission grids. The PGE outage tracker can be filtered by zip code. The EIA tracks and reports on events that impact the energy infrastructure. A BPA study indicated the big 115KV transmission lines crossing over West Hayden Island (and the Columbia/Willamette rivers) is one of their concerns due to liquefaction. BPA’s Ross Complex, in Vancouver, manages 15,000 miles of high voltage lines and hundreds of substations. It’s got a backup in Spokane. The Dittmer Control Center at the Ross Complex, the Celilo Converter and Pacific Direct Current Intertie to the Southwest are major national assets that affect electrical delivery throughout the West Coast. BPA provides about one-third of the electricity consumed in the Northwest – across 15,000 miles of high-voltage transmission lines. If Dittmer is down, Spokane’s Munro Control Center takes over. 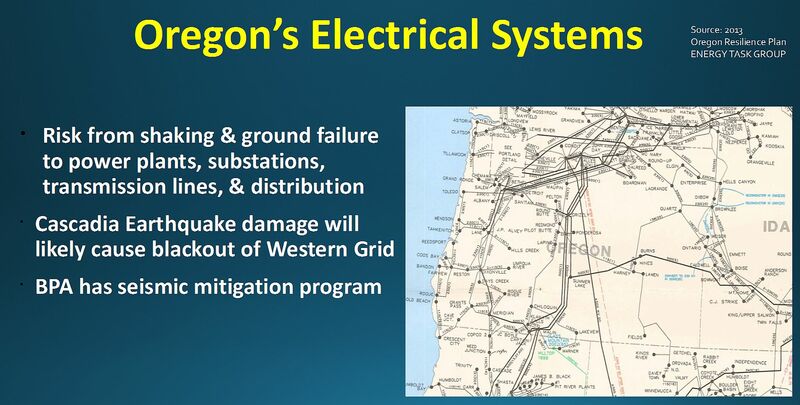 Recent unpublished BPA Cascadia earthquake scenario studies of the existing transmission line system indicate that their main grid would require between 7 to 51 days to make emergency repairs to the transmission line feeding Oregon and Washington from a magnitude 9 quake. Bonneville Power Administration (BPA) maintains a 115 kilovolt, three phase overhead transmission line which crosses West Hayden Island running north to south, midway between the west end of the island and the railroad tracks. Pacific Power and Light also owns an overhead 115 kilovolt, three phase line that crosses the island parallel to and 450 feet east of BPA’s line. Portland General Electric (PGE) maintains a substation located just west of the Burlington Northern Railroad. That substation is fed by an overhead 115 kilovolt, three phase line which taps into PP&L’s line. An overhead 115 kilovolt, 3 phase line crosses the island to supply the Rivergate substation located southwest of N. Marine Drive. Two overhead, 13 kilovolt, 3 phase lines parallel the railroad. One of these lines heads west and serves the north shore of West Hayden Island while the other serves the Jantzen Beach area. An overhead 13 kilovolt, 3 phase line (Mainland Line) heads south from the substation parallel to the railroad. At the shoreline of the North Portland Harbor, the line drops into a vault and crosses the slough as a submarine line. The other serves the Jantzen Beach area. Alcatraz Island has a 305-kilowatt (kW) solar array on top of the main prison building. The solar panels connect to a battery bank and power inverters that help power the island instead of relying solely on diesel generators. It uses Princeton Power Inverters which feature Vehicle 2 Grid using CHAdeMO fast chargers. While the majority of the island’s power is produced by solar, batteries provide additional help when the sun is not present. Manheim’s auto auction facility on the extreme West end of the island, has 200 kilowatts of solar power on the roof of their storage facility. That’s enough to power 20 homes. Normally Manheim’s solar power goes back into the grid but with lines down, it may have potential to provide an alternative source of power. An electric vehicle charge station for perhaps 20 cars (x 50 Kwatt/hrs) could easily provide local power in an emergency. A lot cheaper than dedicated batteries. Today, winter morning loads on Hayden Island often require firing up the River Road gas-powered plant in Vancouver. It’s the 10th largest greenhouse emitter in Northwest. Centralia’s Coal-fired plant in Washington State is the worst polluter. Fuel for the Centralia Plant is delivered by train from the Powder River Basin in Montana. When the Centralia power plant’s smokestacks quit spewing in 2025, it will mean a loss of 1,340 megawatts of energy. With a microgrid, instantaneous load balancing is possible and power could be delivered whether or not the main power grid is up or the transmission towers are down. With Princeton Power Systems GTIB-30 inverters plugged into Leaf+ EVs, it might provide up to 510 kW of peak shaving. Saving both ratepayers and investors millions of dollars. Manheim’s installation covers 16,500 square feet and generates 200 Kilowatts. That’s about one tenth the size of the Oregon Convention Center solar installation which covers over 160,000 square feet using more than 6,500 panels on their roof. OCC’s two-megawatt system cost $2 million, with $500,000 coming from a grant from Pacific Power’s Blue Sky energy program, and an additional $200,000 supplied by the Energy Trust of Oregon. It might feed a 10 MegaWatt/hr battery farm in the nearby SE substation. If BPA and Manheim did a deal for resiliency, wouldn’t that make sense? At some point stockholders will become aware of how much emissions at River Road are costing them in dividends. The efficiencies of distributed microgrid storage may be an idea whose time has come. Vehicle to Grid, or V2G, can send up to 10 kW of power back to the grid. The charging station works with CHAdeMO compliant vehicles, such as a Nissan Leaf. I’m no electrical engineer, but it doesn’t take an EE degree to see the Port of Portland could benefit from a Microgrid at their Rivergate sub-station. It’s all about the cost of electricity and inexpensive energy storage. The Infomart data center in Hillsboro sources cheaper BPA power from the Keeler substation. Google, Facebook, Amazon, Apple, and others contracted for 3.5 GW of renewable power in 2015, much of it solar and wind. Here’s a microgrid plan for Hayden Island (pdf). It would use Manheim’s solar array and grid-tied electric vehicles to provide electrical resiliency. Manheim, PGE and Hayden Island may all benefit with the proper approach. The Utility of the Future is distributed, according to an MIT study. Salem’s Microgrid uses a 1.25 MW/hr lithium-ion battery, but with today’s electric cars like Chevy Volt and Tesla now packing 60KWh batteries, a dozen or so electric cars might deliver close to 50% of Salem’s capacity (600KW/hrs) – at much lower cost. Salem allocates more than $1M/yr for their battery costs. The Columbia Treatment Plant has two 850-kilowatt engine-generators that use about 40% of the plant’s biogas as fuel to generate electricity for the wastewater treatment process and a 200 kW fuel cell running on anaerobic digester gas. On the Island, Manheim has 200kW of solar. Micro-grids provide neighborhood distribution when the main grid goes down. Normally connected to the main electric grid, they can operate autonomously or charge electric vehicles. Funding opportunities might be available. Here are examples Of Microgrids. The Sendai Microgrid Project performed well during Japan’s 2011 earthquake and tsunami, supplying the Tohuku Fukushi hospital with both power and heat for the duration of the two-day blackout. The energy center contains two 350 kW natural gas fired gensets, 50 kW of PV, and modest battery storage. Microgrids serve only a small number of utility customers when they island, but the rest of the time they can serve as capacity, frequency, demand response and other services that benefit all ratepayers. At least that’s what a Washington-based utility claims for their $7 million “smart city” project in Spokane which will include energy storage, a microgrid system and an electric “vehicle to grid” system. Salem’s 5 MW Lithium system is a nice demonstration, but flow batteries are likely more cost/effective for utility scale projects. The Western Energy Imbalance Market is an automated, computerized system that allows utility companies to share energy. Diesel generators offer high power and efficiency for micro-grids, but expensive generators are wasteful if not used…and require fuel. Electric cars, on the other hand, could be recycled. They may generate revenue for organizations like Manheim. The infrastructure is built. No waste. To supplement on demand power, The Columbia Wasterwater Treatment plant, less than a mile south of the substation (map), produces 600 million cubic feet of biogas every year, running two 850 kilowatt generators with a total capacity of 1.7 megawatts, which supplies about 40 percent of the plant’s electrical needs. In major events, landline and wireless telecommunications can be quickly overwhelmed by demand, even if they are 100-percent operational. Restoration of overhead telecommunication wires is secondary to the restoration of overhead power lines. Electrical power is needed to run the equipment while fuel is needed for emergency generators and to supply the vehicles used for emergency response and repair work. US West Communication maintains three, 4 inch ducts along Hayden Island Road. These ducts serve as trunk lines for buildings on Hayden Island. US West also provides service to the NorthRivergate area by a trunk line that runs down N.Marine Drive east of the Burlington Northern railroad. The trunk line has six 4 inch ducts available at the Marine Drive Extension overpass in anticipation of a slough crossing. Most cable and phone lines go to the terminal boxes behind the Denny’s restaurant, beneath the AT&T cell tower. From there they then go out to homes and businesses around the island. Comcast’s small, green neighborhood distribution amplifiers connect to a dozen or more homes in each neighborhood. Fiber maps for Oregon and Washington show the high speed backbones. Integra’s fiber map (above) also shows the fiber that’s incorporated onto BPA’s distribution lines. Fiber is probably more resilient then oil and gas pipelines, but that river tower crossing could be problematic (according to the BPA). FirstNet’s Environmental Impact Statement shows communications throughout Oregon use a variety of publicly and commercially owned copper cable, fiber optics, microwave, wireless, and satellite systems. Here’s a list of facility-based broadband providers that have supplied data for Oregon’s Broadband Map. Fiber optic lines normally terminate and cross-connect in data centers and telco “hotels”, such as the Pittock. For example, the FASTER transpacific fiber has an initial capacity of 60 Tbps and connects the West Coast to Japan through their Hillsboro data center (landing in Bandon). Microsoft is partnering with a consortium of Asian telecom companies to build the New Cross Pacific Cable. Other major distribution nodes in Hillsboro include TGN-Pacific (Pacific City), Southern Cross and Trans-Pacific Express (both with cable landing at Nedonna Beach). Currently there are 28 colocation data centers in 8 areas in Oregon. Data centers in Hillsboro are the new telcos. Amazon, Apple, Facebook and Google all have major data centers located in Eastern Oregon. They have global reach and impact. Submarine cables carry more than 90% of the world’s telecommunications traffic. Transpacific fiber may likely be disrupted at cable landing stations on the coast of Oregon by the expected tsunami. If they are (essentially) obliterated, the economic and political consequences could be significant for the nation. The NSA’s spying operation would be silenced as well. Still, many trans-Pacific fiber lines form redundant loops, some going through California and returning to Asia and Australia via alternate routes. Data might be rerouted from California to Oregon via the I-5 corridor. The Trans-Pacific Express provides a 5 Tbit/s direct line to China. The TPE Hillsboro Cable Landing Station is one of the three cable landing stations in Hillsboro, with one station for TGN-Pacific, and one station for Southern Cross and AKORN Alaska. Oregon’s cable landing stations are located at Bandon (China-US, Faster & TPC-5), Nedonna Beach near Rockaway, (TGN, TPE & Southern Cross), Pacific City (Hawaiki & New Cross Pacific), Florence (ACS Alaska-Oregon Network), and a landing station in Warrenton (Alaska United West). Oregon gets 75% of its oil and gas over pipelines, mostly through the 400 mile long Olympic pipeline which links four refineries in Pudget Sound and terminates in Portland. The other 25% of oil and gas comes in on tankers to Energy Infrastructure Hub and stored in tanks in the NW Industrial area along the Willamette. Kinder Morgan, operator of the Trans Mountain pipeline from Alberta, also operates a branch line running from Abbotsford to Washington that supplies the Shell and Tesoro refinery complex at Anacortes, the Phillips 66 refinery at Ferndale and BP’s Cherry Point facility, the largest in Washington, just south of Blaine. Sightline Institute estimates that 10 per cent of Washington’s crude oil comes from the Alberta oil sands via Trans Mountain, while more than half comes from Alaska’s Valdez tanker terminal. Natural Gas mostly comes in on the William’s Northwest Pipeline with another Natural Gas pipeline coming in from Eastern Washington and Oregon. The Olympic Pipeline, operated by BP, delivers 75% of Oregon’s oil and gasoline. Kinder Morgan also pipes gas to Eugene from the NW industrial area. 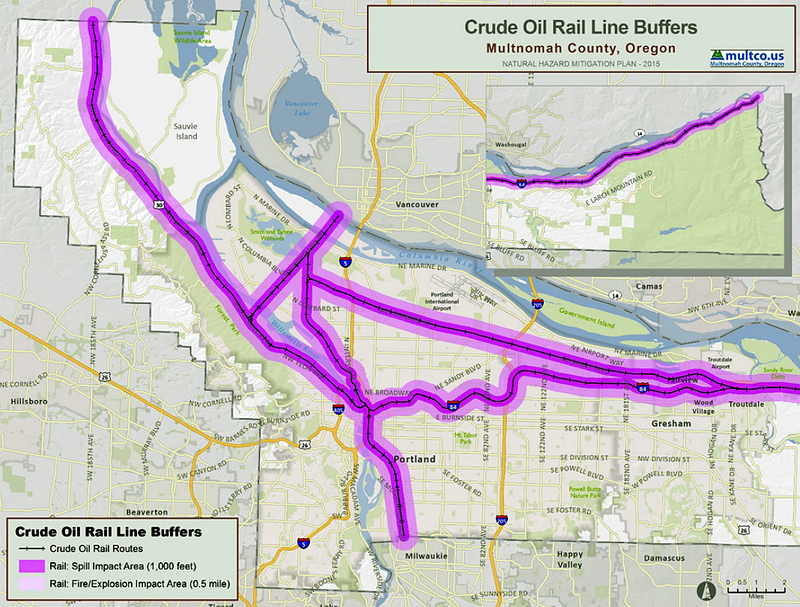 In Portland, an 8.5 mile Kinder Morgan pipeline delivers Jet-A fuel to PDX from the Energy Hub. The Portland Fueling Facilities Corporation runs the fuel operation at PDX. It owns three above-ground storage tanks, two 20,000-barrel and one 40,000-barrel (million gallon) tank. Jet fuel is distributed at PDX via a network of underground pipes, pumps, tanks and load points. Airlines could truck in fuel, but it wouldn’t go far. A truck holds only 8,000 gallons, but PDX uses about 500,000 gallons of jet fuel a day. Natural Gas mostly comes in on the William’s Northwest Pipeline which crosses the Columbia near Troutdale and across Sauvie’ Island as well as the Camas pipeline, which comes down Columbia Blvd. Williams Natural Gas Pipeline supplies natural gas to the Portland area. It runs mostly parallel to I-5, north to Seattle and east along the Columbia River. Pipelines continue south of Portland to supply natural gas to the Willamette Valley. The Canadian-owned GTN natural gas pipeline (Gas Transmission Northwest) runs 1,377 miles, and terminates near Malin, in Southern Oregon. The William’s Sauvie Island natural gas feed goes to the Critical Energy Infrastructure hub, then fans out to serve the City. The other line crosses the Columbia near Camas and travels down Columbia Blvd. Hayden Island’s main gas feed crosses North Portland Harbor by the I-5 Slough bridge then along Hayden Island Drive. Northwest Natural Gas owns a four inch class “B” 57 psi line that runs along N. Hayden Island Dr. It terminates near the railroad. Northwest Natural Gas also owns an 8-5/8 inch class “D” feed main located on the west end of N.SuttleRoad (one block south of Marine Dr). Oregon’s Critical Energy Infrastructure Hub, near the St. John’s Bridge, may be profoundly affected by a large quake. It could make oil, natural gas and other fuels critically short for months. New Fossil Fuel Terminal Zoning would restrict the development and expansion of bulk fossil fuel terminals at the CEI hub. Linnton is near the state’s Critical Energy Infrastructure hub, which is fed by tankers, trains and pipelines including The Olympic Pipeline, from Blaine, Washington to Portland, as well William’s Northwest Pipeline, a 4,000-mile bi-directional natural gas pipeline, and Kinder Morgan’s PDX Pipeline which is an 8.5-mile, 8-inch pipeline which transports jet fuel from Willbridge, (Willamette Bridge) to PDX and has a capacity of 26,000 barrels/day. The energy cluster includes petroleum tank farms, natural gas facilities, electrical substations, pipe and transmission lines. Companies like BP, Kinder Morgan, NW Natural, Olympic Pipeline, and Nu-Star transporting or storing energy. A state report warns of that catastrophe or pipe breaks that could cripple Portland International Airport and create a statewide gasoline shortage. Linnton, downstream from the energy hub may suffer catastrophic impacts from both an inferno and landslides. In 2000, the EPA designated a superfund site stretching from about the Broadway Bridge to Sauvie Island, an 11-mile stretch where heavy metals, carcinogenic PCBs, DDT and other contaminants are buried. Earthquake-induced landslides could push some of that stuff downstream. One of the biggest concerns, of course, is the potential liquefaction of soils that support the current tank farms of Oregon’s Critical Energy Infrastructure. The inferno would be bad enough. The affect on the economy after losing a big piece of the CEI could be incalculable. These facilities are regulated by a number of agencies, reports OPB. The Oregon Department of Environmental Quality (DEQ) regulates the actual equipment of these tank farms. Experts say we need to think about these things so we can take action now. The waterfront area is likely to suffer from it’s poor foundation, collapsing tanks and damaging pipes bringing fuel in and out. Sections of the Astoria bridge could block tankers from bringing additional fuel in and they would have no place to store it even if they could. The Portland Water Bureau can store several days supply of water for the City of Portland. Reservoir 1 and 2 on Powell Butte, 35 miles east of Portland, can hold 100 million gallons of water, which is combined with storage capacity at Mt. Tabor and Washington Park. But Portland’s 130,000 westside customers could be without potable water for six months or longer after a big quake. The city plans a $57 million project to build a 42-inch pipe 80 feet beneath the Willamette River to make Bull Run pipes more resistant to a big earthquake. The Bull Run dams are expected to survive, but 65 percent of the city’s water mains are brittle cast iron. Reservoirs will crack; treatment facilities and pump stations will fail. The result: a total loss of water pressure—both for drinking and for putting out fires. The City of Portland maintains a 16 inch waterline which crosses the North Portland Harbor via the 1-5 bridge to service East Hayden Island. This water line feeds a 12 inch pipe that runs along North Hayden Island Drive terminating at the end of the road, about 200 feet east of the Burlington Northern railroad tracks. The City of Portland also owns a 24 inch waterline that runs along N. Suttle Road and generally extends east on N. Marine Drive as a 12 inch line. Waste water treatment is overseen by Portland Environmental Services which owns and operates nearly 100 sewage pump stations around Portland, including five on Hayden Island. Two of them pump sewage to the Safeway Pump Station. The Safeway facility then pumps sewage to the Hayden Island Pump Station, which pumps it into a large gravity sewer that carries sewage to the Columbia Boulevard Wastewater Treatment Plant. Sanitary sewer lines servicing East Hayden Island terminate approximately 550 feet east of the railroad. The City of Portland also maintains a 10 inch sanitary sewer line which runs along N. Suttle Road to a pump station at the intersection of N. Portland Road and then connects to a IS inch main which runs east along N. Marine Drive. The City of Portland also maintains two outfall pipes, 54 inch and 72 inch, which cross West Hayden Island parallel to and 600 feet west of the railroad. These pipes dump clean water back into the Columbia. Sodium hypochlorite, a strong bleach, is used to disinfect treated wastewater before it is discharged to the Columbia River. The dechlorination facility, near the railroad bridge on West Hayden Island, uses liquid sodium bisulfite to dechlorinate treated wastewater. The Water and Wastewater Task Group reviewed vulnerabilities of the pipelines, treatment plants, and pump stations. A backbone water system would be capable of supplying key community needs, including fire suppression, health and emergency response, and community drinking water distribution points. But damage to the larger (non-backbone) system will take time to restore after a Cascadia earthquake and tsunami. Months or years. The Regional Water Providers Consortium, with more than 20 members, develops the regional water supply plan. Clark County gets its drinking water from three different regional aquifers, the Orchards Aquifer (Upper and Lower) and the Upper Troutdale Aquifer. Unlike Multnomah County, Clark County doesn’t utilize a mountain reservoir like Bull Run. Instead it pumps water from underground aquifers and stores it in water towers, supplied by 11 water stations, 40 wells, about 1,026 miles of pipes, 52 booster pumps. The Discovery Clean Water Alliance is a regional sewer entity of Clark County with four member agencies: Clark County, Clark Regional Wastewater District and the cities of Battle Ground and Ridgefield.The Clark Regional Wastewater District has over 600 miles of sewer lines and 60 pump stations serving a population of 90,000. Clark Public Utilities is a customer-owned utility providing electric and water service in Clark County. In-depth reports are available from Oregon Geological Studies of Critical CEI, The Oregon Resilency Plan, Oregon CEI Risk Assessment, OPB: Quake Could Threaten 90 Percent Of Oregon Fuel Supply, Oregon Live: Energy hub on the Willamette River a catastrophic risk, CRC studies, Portland’s Planning Commission and Natural Resources Inventory, the Port’s West Hayden Island studies and Portland State.